Social media is a critical part of any business trying to build an online presence. But who has time to hang out on social media when there’s a thousand other things to be done? What if I told you there was a way to make it look like you’re always on social media without the hassle of spending way too many hours looking at cute kitten pictures? There is. With the right tools and a little discipline, it’s fairly simple to create a month’s worth of social media updates in a matter of hours. That’s not a typo. How can such a feat be accomplished, you ask? If we ever meet in person, it will become quite clear to you that I’m not the most disciplined person in the world. However, my years of corporate slavery as an admin assistant have taught me how to be extremely productive when it comes to getting stuff done at work and in my business. Another valuable lesson I’ve learned is that everything is easier to handle with the right tools. And for social media management, I find that Feedly, Pocket and Hootsuite is the perfect combination to knock out this essential marketing task quickly. Let’s discuss each tool on its own, and then move into how they work together to create a fast and efficient social media workflow. One of the biggest mistakes people make is joining every social media channel known to man. Before you open up 100 different business accounts, take the time to learn where your customers are hanging out, and focus your efforts there. Thriving businesses do so well because they know their customers. Choose two to three sites and focus on those. You can’t go wrong by choosing Facebook, Twitter or LinkedIn (or all three). If you’re an online retailer, Instagram is a good choice, too. Once you’ve chosen your accounts, now it’s time to talk workflow. Let’s take a look at the three secret weapons in your social media arsenal. Remember when RSS was the hottest technology around? Even though it’s no longer the most popular tech trend, it still silently lurks in the background of many websites, making it extremely simple to import your favorite articles to the reading app of your choice. 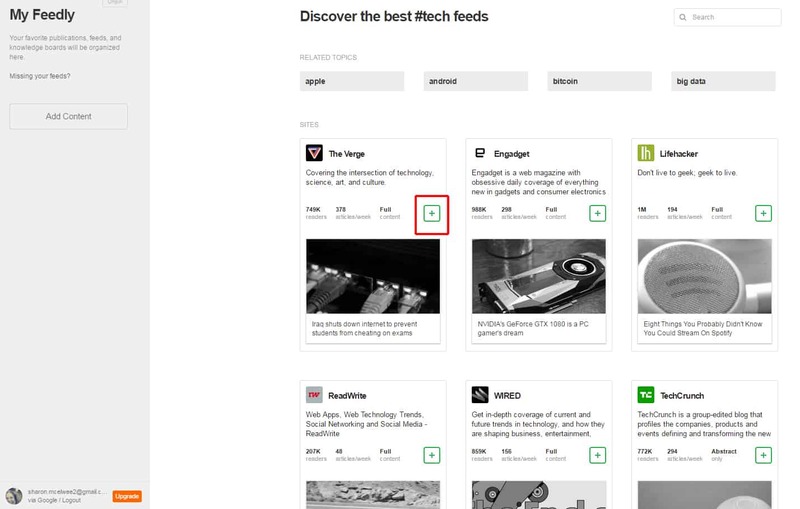 Feedly is an RSS-based reader app that collects your favorite blogs and publications in one place. 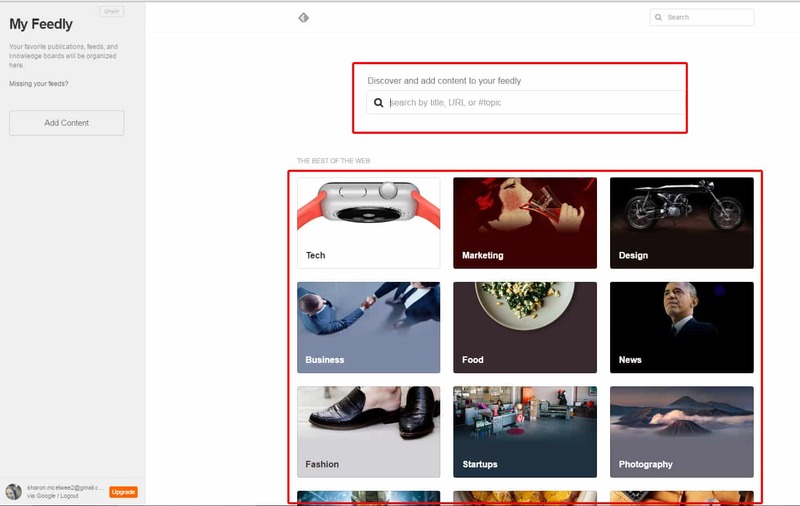 Once you open a Feedly account, there are two ways to add content to your account. 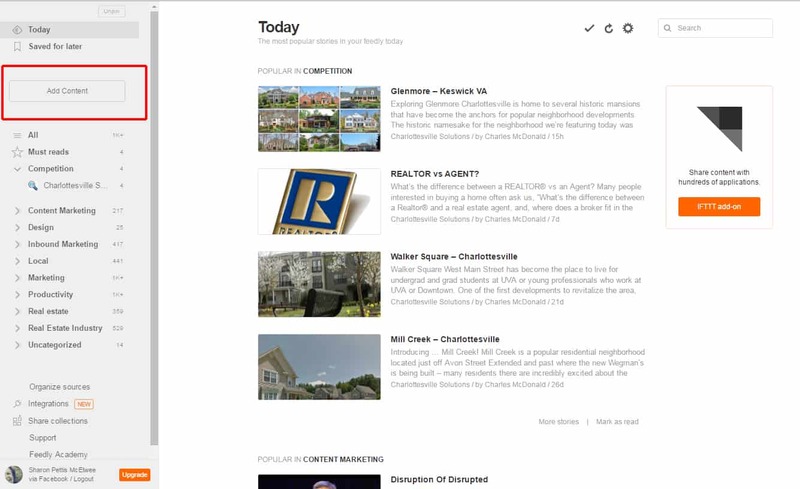 You can enter a publication title, URL or topic directly in the search bar. Clicking on any of the categories below the search bar will open up a page full of suggested feeds that you can easily add to your account by clicking on the green plus sign. As you can see from the image above, the categories you created run down the side, making it simple to find whatever you want to share. Click on the > next to the category to show the list of publications within a category. Choose your publication and click on the title you would like to open. 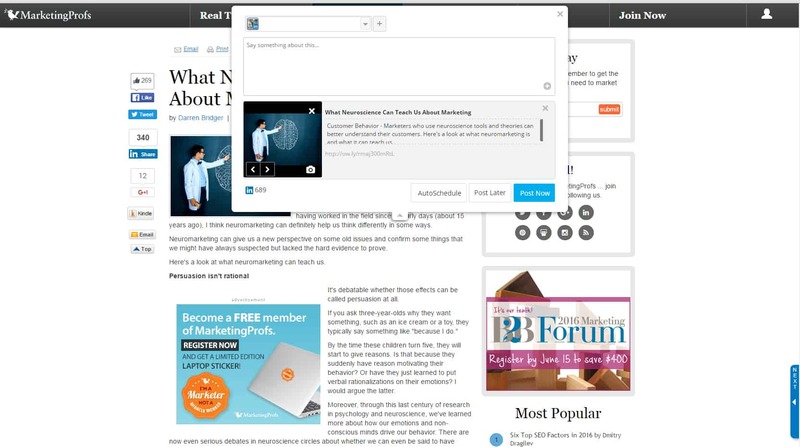 Once you open the article in a different tab, you can share it on social media. Next we’ll talk a little about Pocket. Ever read something that was so good you want to save it for future reference or share with your social media followers? 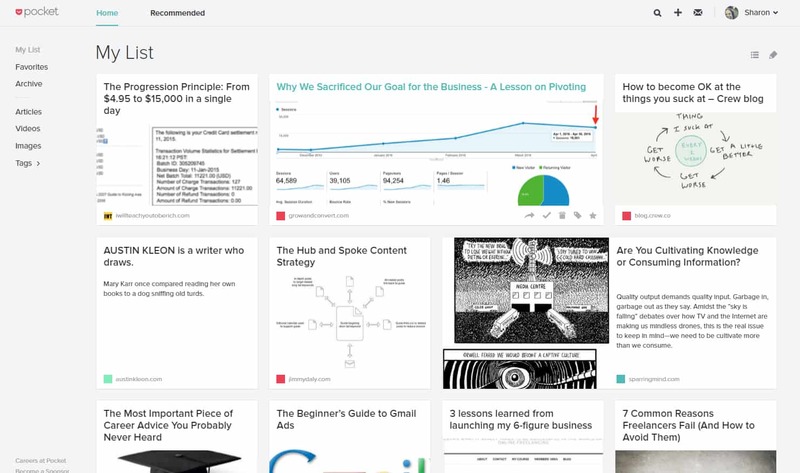 Pocket is a web-based app that let’s you do just that. As you’re browsing the web, you can open it in another browser tab or use a Chrome extension to quickly save items of interest. You can set up tags to create categories for your list and delete items easily. Pocket is great for heavy readers who are not loyal to any particular publication. I use it to collect writing research, freelance job listings, and to save interesting items to share with my social media followers. The best thing about Pocket is the Chrome extension. When you find something worth sharing or saving, just click the Pocket button in the upper right corner of your browser and it instantly saves it to your Pocket account without having to open another page. If you don’t have an account, create one and connect your social media accounts. You can connect personal Facebook accounts, Facebook business pages, Facebook group pages, LinkedIn, Twitter, YouTube, and several other account types. For this tutorial, we are going to focus on the Publisher feature in Hootsuite and the Hootlet Chrome extension. 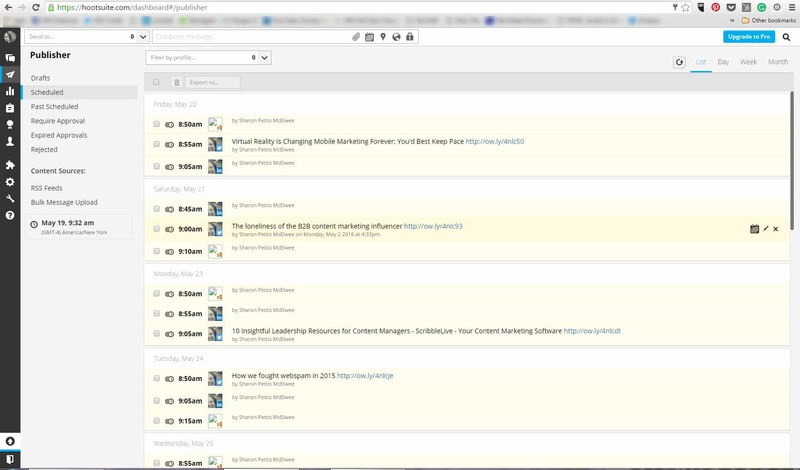 Once you create a Hootsuite account, click on the paper airplane on the left to access Publisher. This is where you can your publishing schedule for your various social networks. If you look closely at the screen, you can see that the posts are arranged by date and time. The little clock icon next to the checkbox means that I used Hootsuite’s AutoSchedule feature. You can change your AutoSchedule settings by clicking on the gear icon on the left. These settings allow you to choose the days of the week you post as well as the amount of times per day you want to share something. Notice the little owl in the upper right-hand corner of the screen next to the address bar? That’s the Hootlet extension. This is where the magic happens. We’ll talk more about that in a minute. For now, just install it in Chrome and be sure it’s enabled. Now that you have a Feedly, Hootsuite and Pocket account set up, let’s talk about how to use these three tools together to make your social media management process more efficient. Whenever I plan my social media posts for the month, I set aside a couple of hours to get things done. It may take you a little longer the first few times until you get the hang of it. But trust me. Your life will be so much simpler once you get the process down! Open Feedly. Choose an article you’d like to share from the list. Click the Hootlet button. In the dropdown menu, choose which social network you want to post to and a preview will appear. You can also write a message in the box if you choose. When you’re finished, hit the AutoSchedule button and Hootsuite will schedule the post according your settings and what it believes the best time of the day is for your audience. You can check your Publisher in Hootsuite to be sure everything posted, as well as adjust anything that you don’t like. It usually takes me around 2-3 hours to do a month’s worth of posts. In order to stay engaged with your followers, you may want to turn on email notifications so you can respond promptly. We hope you’ve enjoyed learning about how to manage your social media workflow. Do you have a tool in your arsenal we haven’t covered? Tell us about it in the comments; we’d love to hear from you! Next Learn to build a landing page that actually converts those social media traffic!